Maldon United Reformed Church, Market Hill, Maldon. The church occupies a prominent town centre position at the top of Market Hill, on the right as you leave the High Street and proceed towards Heybridge. The church and its adjacent hall are widely used by the local community; both venues have catering facilities and the church has a public address system. Limited car parking is available for functions. 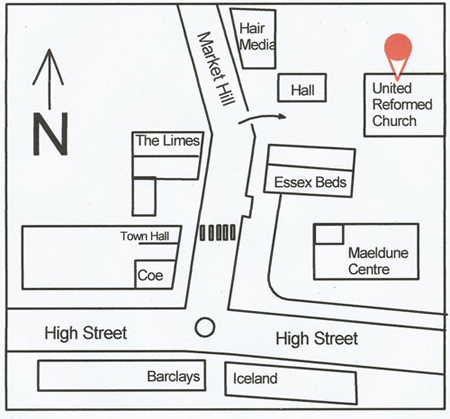 Please note that Maldon URC does not have a designated postal address. The post code for the building directly opposite the church, The Limes, is CM9 4PZ which may help when using 'sat nav' systems.